CITY OF INDUSTRY, Calif.--(BUSINESS WIRE)--Utility Trailer Manufacturing Co., the industry’s largest manufacturer of refrigerated trailers and a leading manufacturer of dry freight vans, flatbeds, and Tautliner® curtainsided trailers is pleased to announce that its Paragould, Arkansas manufacturing plant has received a Plant Safety Award from Liberty Mutual Insurance. “We are honored for being recognized by Liberty Mutual and receiving their Silver Safety Award. This award is the result of the hard work by all of our employees, and the continued support from our Management and Owners,” said Sean Graddy, Utility’s Paragould Environmental Health & Safety (EHS) Manager. 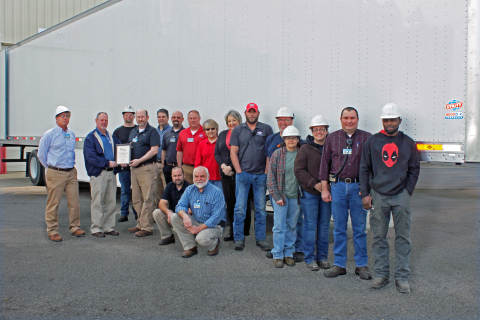 “Year after year, the Paragould plant has continued to maintain an exemplary safety record, and has now been recognized with its 12th Liberty Safety Award. In fact, 10 of these 12 awards have been either Silver or Gold, which is a huge achievement,” said Bob Griffis, Corporate EHS Manager for Utility Trailer Manufacturing. Liberty Mutual's Safety Awards are based on the days away, restricted and transferred (DART) rate, which is calculated from the number of hours worked relative to the number of accidents at the plant. Lower numbers of accidents result in lower DART rates. In 2017, Utility’s Paragould plant had a DART rate of only 1.32, with over 1.3 million worked hours. The average DART rate for the trailer manufacturing industry was significantly higher, at 3.7. A Silver Safety Award is presented for DART rates of 40% or lower of the industry rate. Utility Trailer Manufacturing Company is America's oldest privately owned, family-operated trailer manufacturer. Founded in 1914, the company designs and manufactures dry freight vans, flatbeds, refrigerated vans, Tautliner® curtainsided trailers, and aerodynamic side skirts. Utility currently operates five trailer manufacturing facilities across the United States. Utility’s 3000R® and the 3000R® multi-temp refrigerated trailers are manufactured at the Marion, Virginia and Clearfield, Utah plants. The 4000D-X Composite® series and 4000D® dry vans are manufactured at the Glade Spring, Virginia and Paragould, Arkansas plants. The 4000AE™, 4000S®, and 4000AE™ Drop Deck flatbeds as well as the Tautliner® are all manufactured at the Enterprise, Alabama facility. Utility also has an extensive independent dealer network with over 100 locations throughout the United States, Canada, Mexico and South America. Visit: www.utilitytrailer.com for more information.